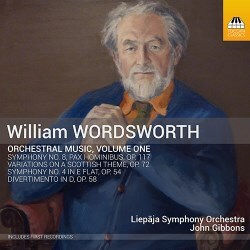 A good few years ago I purchased the Lyrita CD of William Wordsworth’s Second and Third symphonies (review). Subsequently, my positive experience of that disc, together with the enthusiastic reviews by no fewer than three of my colleagues, led me to acquire another Lyrita disc which contained recordings from the Richard Itter archive of broadcasts of the First and Fifth symphonies. Now this disc from Toccata swells the Wordsworth discography still further, increasing to six the number of his eight symphonies which are now available on disc. I notice that this new release is billed as Volume 1, so the chances of the two unrecorded symphonies – the Sixth and Seventh – entering the catalogue may be reasonably good. I first encountered this CD in the MusicWeb International Listening Studio just before Christmas, when we auditioned extracts from both symphonies. I think it would be fair to say that in the case of the Fourth we admired the music without being entirely blown away by it. Now that I’ve had the opportunity to explore the symphony at greater leisure, I’ve found much more in it. The symphony was dedicated to Sir John Barbirolli and the Hallé Orchestra, who premiered it at the 1954 Edinburgh Festival. It’s cast in one continuous movement and is scored for a large orchestra, including a substantial percussion battery. Fortunately for neophyte listeners like me, Paul Conway’s notes guide one through the events of the work very surely. After a slow, atmospheric Poco adagio introduction, the main Allegro (1:32) is vigorous and forthright. The second subject (2:59) is a rolling tune which Paul Conway accurately identifies as having an Elgarian touch to it – I was put in mind of a passage in that composer’s First Symphony. There follows a martial section (5:48), which is quite forceful and in which the xylophone has a prominent function. For much of the time this episode of music, which is quite extended, is underpinned by pronounced rhythmic figures sounded in the lower reaches of the orchestra. The climax (around 8:00) is very potent. Gradually, the music subsides into a Poco adagio section (from about 11:27). Near the start of this I admired a succession of expressive woodwind solos – and the delivery of those solos. As the music progresses it becomes more intense and eventually it builds to a powerful passage in which the ‘rolling’ theme is very evident. The tempo quickens and from 18:41 there’s an energetic section in which material from earlier in the work is revisited; hereabouts, there’s some quite powerful writing. Our old friend, the xylophone ushers in a vigorous conclusion (from about 21:50), which is big and emphatic. I think Wordsworth’s Fourth is an impressive work. The material is interesting, as is the way in which it is used and developed. The orchestral scoring is resourceful. According to the notes, Barbirolli never played the work again after giving the premiere, which is a pity. The Eighth Symphony is the composer’s last completed score. It came about thanks to Wordsworth’s fellow composer, the late Martin Dalby (1942-2018). Dalby was Head of Music for BBC Scotland (1972-1991) and used his influence to secure a commission from the BBC for Wordsworth to write this score. Its title, Pax Hominibus bears testament to Wordsworth’s life-long stance as a pacifist, Paul Conway tells us. The symphony is cast in two movements. You may wonder why two timings are given in the review header. The reason is that Wordsworth provided two endings, leaving it to the discretion of the conductor to use the second ending if factors such as the size of the hall or the rest of the concert programme made the alternative ending seem more suitable. The alternative ending, which I’ll discuss in a moment, lengthens the work by only about 25 seconds. Toccata very generously include the whole of the second movement again, this time with the alternative ending, as the final track on the CD so that listeners can hear the work in whichever form they wish. The first movement begins with a slow and thoughtful introduction, commenced by a pair of horns. The main body of the movement is marked Animato (from 1:21, I think; I haven’t seen a score) and at this point the music becomes more energetic. For the remainder of the movement passages of strong, often contrapuntal music vie with slower, expressive episodes for the listener’s attention. The overall tone of the music strikes me – perhaps wrongly – as rather austere, so it is something of a surprise when the movement ends on a warmly consonant chord, enriched by the brass. The construction of the finale is somewhat unusual. It opens with what Paul Conway describes as a “peculiar ‘clucking’ idea”. At 1:02 we hear a more tenderly textured passage, ushered in by a lovely oboe solo; from that tune flows a lot of the subsequent music. At 3:41 the ‘clucking’ motif returns and I think, without seeing a score, that what follows is a full repeat of the movement to date. This leads to a brief recapitulation of some of the material from the first movement and then, at 7:47, a series of chords over a sustained pedal note – B natural, I think. Gradually, the music recedes until nothing is left but a chord played by a pair of clarinets, which dies away a niente. In the version of the movement that includes the alternative ending (track 17) the pedal note is sounded (about 7:50) but thereafter the music proceeds via a lengthy crescendo to a loud conclusion. Paul Conway expresses a preference for Wordsworth’s original thoughts, embodying the subdued ending, and I strongly agree with him. I have to admit that the Eighth Symphony is a composition that, so far, I find less approachable than the Fourth. It’s a work that I respect, however, for its undoubted musical integrity. Like everything else on this disc, the symphony receives a very committed and skilful performance. The disc opens with the Divertimento in D, which is cast in three movements. The music is founded on a four-note motif which is of key importance to each movement. The first movement, ‘Overture’, opens with a short, slow introduction, after which there’s a good deal of bracing counterpoint as well as some winning melodies. At the end of the movement the material from the introduction is reprised and expanded to form quite an imposing conclusion. The central ‘Air’ features a lovely oboe melody near the start – and later there’s an equally appealing melody for the clarinet. The movement as a whole is a most appealing, lyrical creation. Finally, we hear ‘Gigue’, which is good-natured though with a note of seriousness not far below the surface. This Divertimento is most attractive. The Variations on a Scottish Theme were composed in 1962 for performance by a small ensemble but the piece was later expanded into an orchestral version, first played in 1964, which is what’s performed here. The Scottish Theme in question is the tune ‘A Hundred Pipers’ which Wordsworth uses as the basis for nine brief and pithy variations. As with all good sets of variations, the theme is always discernible without fettering the composer’s imagination. I especially liked Variation 5 (Adagio espressivo), which is the longest part of the work and most attractive. Variation 6 features an interesting minor-key variant of the tune. The ninth and last Variation starts with a brief fugue, after which various instruments, including the xylophone, toss fragments of the tune around before the end. This is a genial and entertaining piece which I enjoyed very much. It’s good to hear smiling music by this essentially serious composer. This is a very worthwhile disc – my reserve as regards the Eighth Symphony is entirely personal and, anyway, may disappear with greater familiarity over time. William Wordsworth was a composer with much to say and his music is well worth hearing. John Gibbons and the Liepāja Symphony Orchestra give accomplished and committed performances and I take off my hat to the versatility shown by the members of the orchestra, to whom this must surely have been completely unknown music. The recorded sound is fully satisfactory. Paul Conway’s notes, on which I’ve drawn in compiling this review, are exemplary: he gives an excellent biographical sketch of Wordsworth and his career, followed by notes about the music which guide the listener through the scores in a surefooted manner. His notes derive from a much more substantial essay on William Wordsworth and his music which appeared on MusicWeb International a few years ago.